Have a large amount of fresh fruit from the garden or co-op? These no cook fruit leather dehydrator recipes are an easy and healthy snack for your family. Dehydrating is a terrific way to preserve the harvest, especially when you have a significant amount of fresh fruit from the garden or co-op. Try these fruit leather dehydrator recipes to make a healthy snack for your family. Start with washed fruit. Cut out any obvious bruises; these will affect the taste of the finished product. Remove stones and large seeds. Fruit with small seeds (like strawberry) can stay, or you can strain them out later. 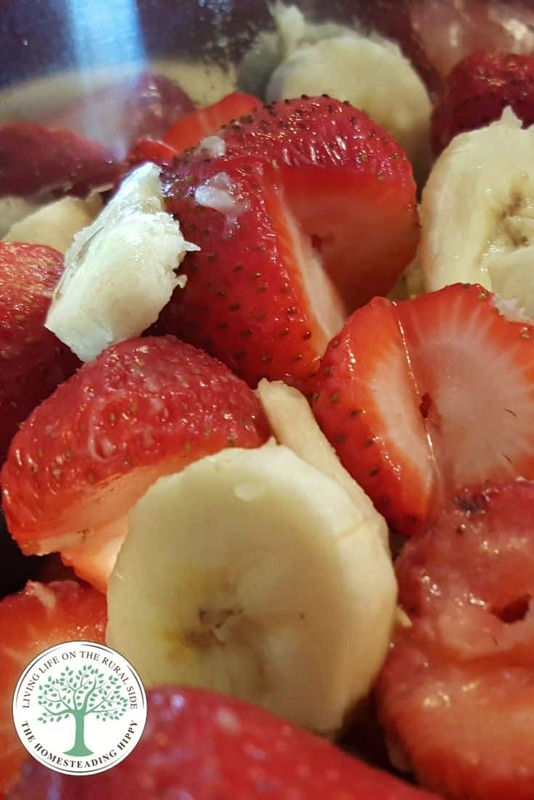 Place the fruit pieces into a blender or food processor and blend until smooth. Taste and add sweetener, if desired. You’ll find that fruit leather tastes excellent without added sugar. Too thin – drain it through a sieve. Too thick – add more water or fruit juice if needed to achieve a smooth consistency. Sugar and honey are interchangeable in these recipes. Sugar tends to make a fruit leather that is on the brittle side and honey will leave the fruit roll a bit stickier. Experiment with the amount of sweetener and its taste to see which your family prefers. Even maple sugar or agave can work. 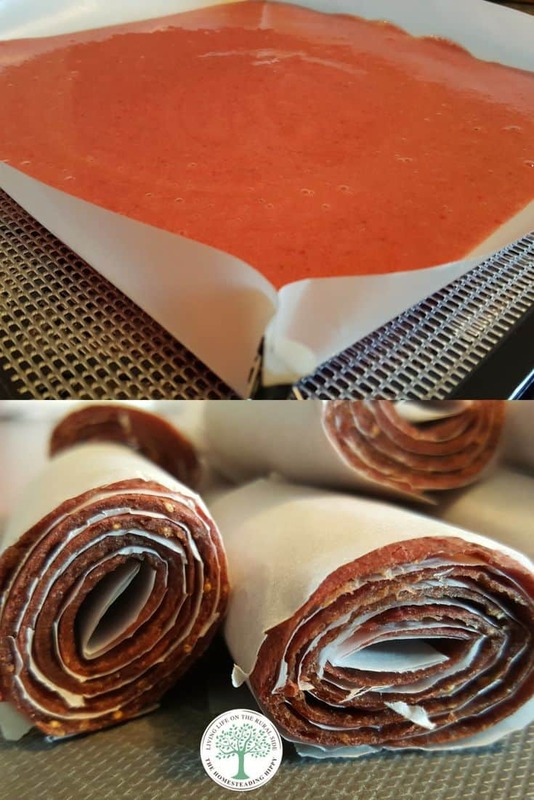 If you have a round dehydrator, you can use the fruit roll sheets that came with the machine. If you make a lot of dehydrated fruit leather, it’s worth investing in extra sheets. (they last forever) If you have an Excalibur Dehydrator, then purchase extra non-stick dehydrator sheets so you can load up several trays at once. Spread the fruit puree in a circular pattern to within one inch of the non-stick sheets, or right to the edge of the plastic sheets. The outside edges will dry faster than the inside, so they should be thicker than the center. Dry fruit leather at 125 degrees F for six to eight hours. The leather should be translucent, slightly tacky to the touch, and peel away from the liner without sticking. 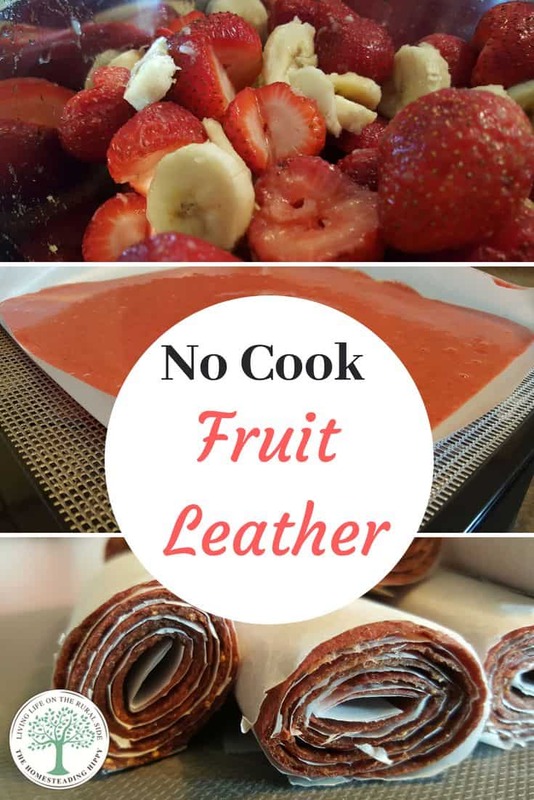 Your fruit leather should be removed when warm, so it comes out in one piece. Combine the ingredients into a blender and puree until smooth. Taste and add sweetener if desired. Remove seeds if desired. Swirl out on sheets (see above) on dehydrator trays. Dry for six to eight hours at 125 degrees F. Makes one full tray. Remove skin from the mango and nectarine. Combine the ingredients into a blender or food processor and puree until smooth. Taste and add sweetener if desired. Add additional water to achieve desired consistency. Swirl out on sheets (see above) on dehydrator trays. Dry for six to eight hours at 125 degrees F. Makes one full tray. Thaw frozen blueberries and reserve 2 tablespoons of the juice. In a food processor or blender, combine the blueberries, reserved berry juice, vanilla, and honey. Puree until very smooth, about 1 minute. Once the fruit sheets are completely dry, use a pizza cutter to slice them into one-inch wide strips, and tie them with a piece of string. They can be wrapped with or without parchment paper. Store the fruit leather in a jar or container with a tight-fitting lid. These wraps will last in the dark pantry cupboard for 6 months, but you’ll find that it’s hard to keep them around that long! These recipes are inspired by a book I’ve just finished reading called Prepper’s Dehydrator Handbook by my blogger friend Shelle Wells. Don’t let the name of the book fool you, it is full of detailed dehydrating tips for over 50 fruits and vegetables. She also covers how to dry herbs, make jerky and store it all in your pantry long-term. You can find her other dehydrating ideas over at her website Rockin W Homestead.